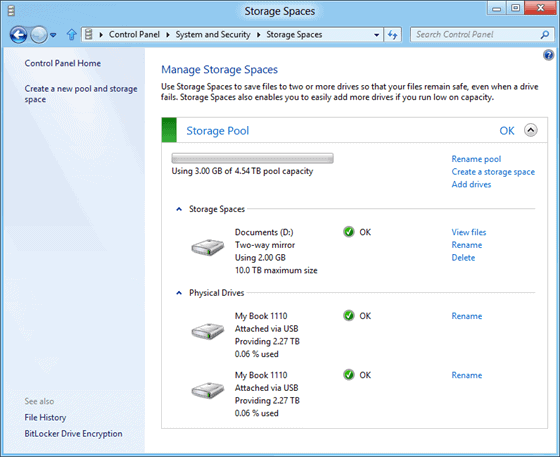 Windows 8 Storage Spaces is a new feature introduced by Microsoft. It is concerned with two key techniques related to storage Virtual Disks & Drive Pools. As the name suggests, Virtual Disks is a hard disk virtualization technology which allows users of windows 8 to create and use virtual disks. Virtual disks are more or less similar to real hard disk with few subtle differences. The only thing, which you can’t do with virtual disks is, they cannot be used for booting process. On the brighter side, virtual disks provide great support for two most desirable features as far as data storage is concerned Thin Provisioning & Resiliency to failure. While, thin provisioning can be used to enhance the data storage efficiency, Resiliency to failure makes sure that the data is safe and remain available even in abnormal situations like hard disk failure. Resiliency can be achieved either though mirroring or parity. In mirroring, data are replicated to more than one drives, so that it is recoverable even if one of the drives fails. In parity, we save data information along with the data, so that data can be reconstructed if a failure occurs. Also, check other Windows 8 Features reviewed by us. Again, as the name suggests, Drive Pools are used to blend two or more hard drives to create a pool of storage space. Using this technique, we can combine two or more entirely heterogeneous (in terms of speed and storage capacity) hard drives to create a big pool of storage space.